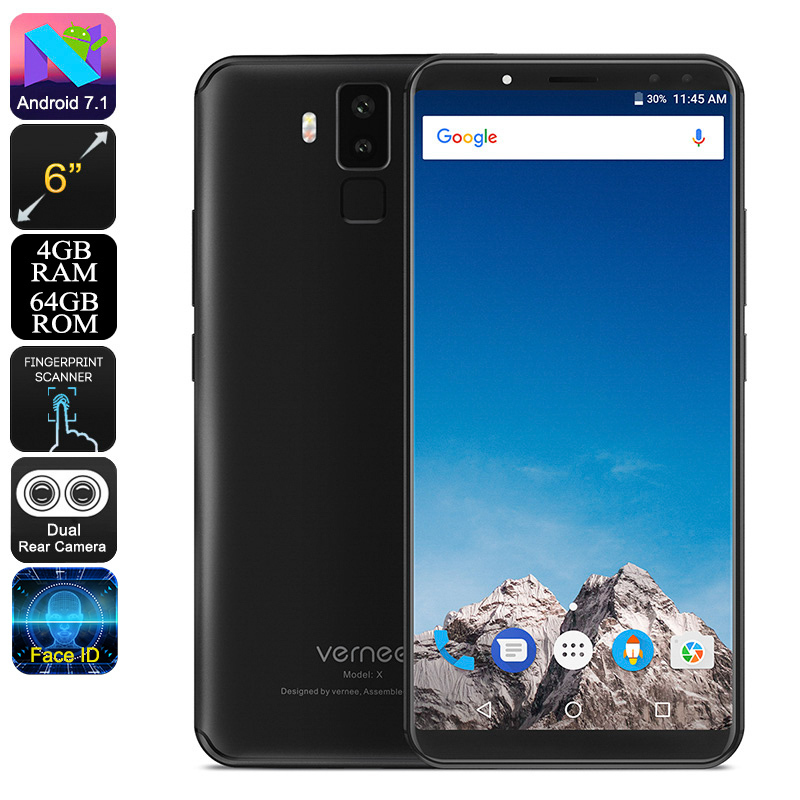 Successfully Added Vernee X Smartphone - 5.99 Inch 2K Screen, 4GBRAM, 64GB Memory, Face ID, Dual Front + Rear Cameras (Black) to your Shopping Cart. The Vernee X smartphone is the latest offering from this relatively new smartphone brand. Inspired by the iPhone X this phone has a clean and sleek design and even incorporates Face ID, but also has the fingerprint scanner which is standard on most phones today. The phone offers great value for money as it comes with high-end specs and mid-range price tag. A large 5.99-inch display delivers lush 2K resolutions that are great for gaming and watching movies. The 83.8% screen to body ratio allows the large display to fit into a respectably small body so the phone still manages to be easy to hold and operate with one hand. Inside this stunning-looking phone is a Mediatek Helio P23 Octa Core CPU. It has 4 cores running at 2.5Ghz and 4 running at 1.65GHz. This balanced setup is able to deliver a powerful performance when needed and is also energy efficient so you get more battery life. Having 4GB of RAM as well as the ARM Mali-G71 MP2 GPU means the Vernee X Smartphone can handle the latest games and most demanding apps without dropping frames or stutters. Therefore its a powerful contender for games and movie buffs alike. This version of the phone comes with 64GB of onboard memory which should be enough for most users, however if you do need extra space you can take advantage of the micro SD card slot. Dual 4G SIM slots let you run two numbers on this phone simultaneously, this makes it easier to manage your business and personal contacts and is helpful to avoid roaming charges while also providing better coverage. Having 4G available on your phone means that surfing the web and downloading HD video content isn't going to be an issue. The front and rear cameras on the Verneer X both benefit from dual lenses. The rear camera is great for low light shots and brings quality images that are sure to impress. And for the front camera its not just limited to selfies, thanks to the dual lenses it can be used for face ID. this lets the phone use face recognition for securing your phone. If you'd rather stop with the fingerprint scanner then you can reach to the rear for that as well. A large 6200mAh battery is one of the best features of this phone. With a battery double the size of most smartphones you will be impressed by the usage times. This smartphone can manage about 20hours of continuous call time or around 9 days in standby, this should be enough to see most uses through a weekend of regular use so its great if you forgot to pack our charger. Using the provided fast charge cable and adapter that comes with the phone you can take the battery from 0 to 100% in a remarkably fast time, so when the battery final does run down it won't take you long to get going again. The Vernee X android phone comes with 12 months warranty, brought to you by the leader in electronic devices as well as wholesale android phones..